Do I need a new oil tank? Should I replace my oil tank? Oil tank replacement is a crucial investment. So how long do oil tanks last? Tank failure is the typical indicator that it’s time to replace indoor oil tank units, though you will often be able to spot the warning signs long beforehand. In most cases, an oil tank will last between 15 and 20 years — roughly two or three times the length of the average residential occupancy. Therefore, if a tank is approaching its 15th year at the time you sign your lease agreement or close on your home loan, you could be facing an additional expense to all your other move-in costs. Granted, an oil tank could last considerably longer than average with proper upkeep and periodic maintenance. Regardless of how a tank behaves, however, you should have a professional inspect the tank by its 15th year for signs of wear and possible performance issues down the line. How Do I Know If I Need a New Oil Tank? When it comes to concerns about home-heating systems, homeowners will often wonder about when is the best time to replace an oil tank. This concern can be especially pressing when you first move into a home. After all, the last thing you want is to learn about an aged, failing oil tank the hard way. When you buy a house, you should have the oil tank inspected, even if you know it’s only a few years old. The tank may appear to be in optimal condition to the naked eye, but you never know exactly how well the previous homeowner treated it. 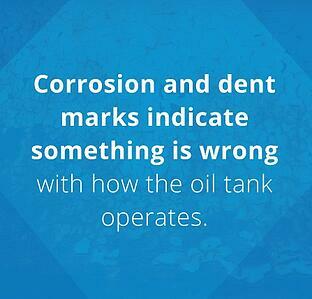 Rust and dents — Corrosion and dent marks indicate something is wrong with how the oil tank operates. Wet spots — The presence of wet spots, either underneath the tank or on its surface, is an indicator of trouble. Unstable legs — In many cases, problems with an oil tank will be the result of faulty installation. A dead giveaway of this issue is when the legs appear uneven, in which case the tank would have trouble functioning at its full capacity. If the legs appear unstable in any way, have the tank inspected immediately. Exposure to frosty elements — If the tank is outside your house, or situated in an area where winter conditions like snow and ice could make their way into the tank, have the tank inspected for possible signs of damage. Faulty vent alarm — If the tank features a vent alarm, yet you don't hear a sound when you fill the tank, it's a sign of malfunction that should be professionally serviced. Frozen/broken fuel gauge — If the fuel gauge is stuck or broken, have it fixed immediately. Oil runs — If stray oil is present anywhere near the tank — particularly around the gauge or on the ground underneath — you probably have a leak. Unprotected oil lines — Inspect the lines that carry oil between the tank and the furnace. If the rubber tubing is split or cracked at any point, have the unit serviced immediately. Pipe clogs — If the vent pipes are clogged due to infestation or wintry elements, have them cleaned as soon as possible. Oil inefficiency — If you’re using oil faster than necessary, have the tank inspected for leaks or other issues. If any of these issues arise with your tank, have the unit inspected by a licensed technician, who will diagnose the problem and let you know the options, be it repair work or an all-out replacement of the oil tank. During the colder months of the year, an oil tank is at its most vulnerable to wear and tear. After all, these are the months when your house burns fuel to keep everyone warm inside. If your tank is situated in an open-air location, the unit could be at an even greater risk for advancing wear during winter months. As such, oil tank precautions are just as important as reinforced doors and windows as the cold season approaches. The biggest danger to an oil tank is snowfall, especially when snow makes its way inside the unit. If the tank is directly exposed to the white flakes of winter, the effects could seriously damage a tank to the point where it would need to be replaced, even if it was only recently installed. 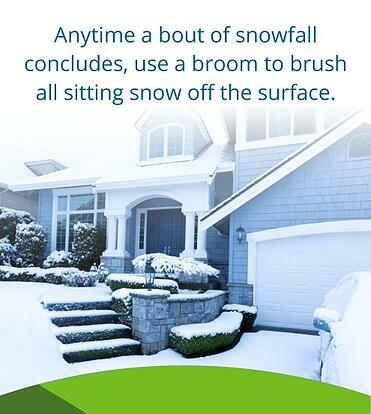 Remove snow — Anytime a bout of snowfall concludes, use a broom to brush all sitting snow off the surface. Do not use a shovel to remove snow from the tank, as this could damage the unit. Remove overhanging icicles — If icicles could potentially fall onto your oil heat tank, remove them from wherever they hang, whether it's from the roof drain or an overhanging tree branch. Even if only one icicle hits your oil tank, it could potentially damage the unit. Clear a maintenance pathway — If you need to call a maintenance professional to inspect your oil tank for damage, clear the path of snow and ice to ensure easy access to the tank. Inspect for damage — After the snow has passed, inspect your tank for any signs of cracks, dents or other damage. If you know or suspect the tank has been damaged, call your service person. In the event you do need tank repairs, don't attempt to fix anything yourself, as this could likely cause further damage. If you do have reason to believe your oil heat tank is broken in any way, contact a licensed professional to inspect and service the unit. On a lot of houses, the oil tank will be situated with one side facing the wall, and therefore obscured from view. This positioning can make a tank more difficult for the untrained eye to inspect. If your tank is set up this way, it is crucial to have the unit inspected annually to ensure it continues to operate at its full potential. In most cases of tank failure, the problem will slowly emerge on the inside, and gradually make its way to the exterior. Consequently, a problem could germinate for years before showing any noticeable signs of damage. By the time the problem becomes obvious from the outside, it will already be too late to rectify. In situations like these, the only remaining option is tank replacement. The most common internal problems with oil tanks involve trapped moisture and sediment, which accumulate as the years pass. As the problem becomes more serious, the internal buildup will burn tiny holes along the body of the unit. When holes form, oil escapes. In worst-case scenarios, the tank will break much more drastically, to the point where a major oil spill occurs. Disasters of this magnitude must be cleaned up immediately to stop the saturation of oil into the surrounding soil, which could otherwise become hazardous if the mess is left to fester. The cleanup in situations like these is generally costly. Even if your heat tank is located in your basement, you wouldn't want the oil to leach into the underlying concrete, which can cause a lingering stench that could permeate your basement and ultimately spread throughout your house. Should I Replace an Old Oil Tank? If an oil tank is more than three decades old, it has probably outlasted the common life expectancy of tanks due to periodic maintenance and upkeep. Nonetheless, a tank this old will inevitably have a layer of sediment at the bottom. If the oil level ever gets low, the sludgy sediment could gradually make its way into the oil lines and cause the system to clog. Therefore, replace a tank that is 30 years old as a preventive measure, even if it appears to be functional at present. What Are the Benefits of a New Oil Tank? When you buy a new oil tank for your house, you'll have a more concrete idea of what you are getting in terms of your heating system. Whereas an older heater — or, for that matter, a five-year-old heater that comes with a house — will be a mystery to some extent at the time you move in, a new oil heater could give you much greater confidence as a homeowner, especially during the colder months. Protect your furnace — In a new oil tank, there is no buildup of sediment and sludge, and therefore no risk of your oil lines getting clogged with sludgy matter. Avoid tank failure — A new tank will not have lingering internal problems — the kind that are typically undetectable until the problem gets out of hand. As such, you aren't likely to have leaks or holes in the foreseeable future, and you most certainly won't have to deal with a costly, toxic rupture. Boost safety — Some of the most common problems with older tanks — unstable legs, clogging and eroded tubing — are hard to rectify. These problems generally don't exist with newer tanks. Conserve energy — A new tank will function to its maximum potential, and therefore yield optimal efficiency. With a new oil tank, you save energy, which can help you save on your monthly bills. A new oil tank will typically last at least 15 years, which is twice as long as most homeowners occupy the same residence. A well-maintained oil tank can last at least two decades. Whether you decide to move after seven years or keep the property for twice that time or more, you probably won't have to sink big money into an oil heat tank once you have made the initial investment in a new unit. Should an Unused Oil Tank Be Removed? On some older homes, an active oil tank will be attached to the house on the outside, yet an old, inactive tank will still sit in the basement. If this describes the tank situation in your house, you probably can't help but wonder whether the inactive tank is truly benign. In all likelihood, the indoor tank was never much good in the first place. Basement oil tanks from earlier in the last century tended to be badly made and poorly installed. Consequently, basement tanks would often expire early. As a result, homeowners opted to ditch those tanks for newer outdoor units. Lingering sludge — An abandoned tank in an occupied house will have likely been pumped of its fluid, but that doesn't mean it's entirely empty. In fact, there's no such thing as a verifiably empty tank. The traces of liquid and sludge that do linger could potentially be hazardous. Condensation — To prevent interior moisture buildup and corrosion, an indoor oil tank must be sloped so the condensation drains into the inline filter. When the oil tank is left dormant, it just becomes another rust-prone unit that frequently gathers moisture from the basement atmosphere. Wasted space — The unused oil tank is likely taking up space that could otherwise be used for boxes and antique furnishings. Furthermore, the hazardous effects of a dormant tank could degrade the quality of items stored in the basement. Simply put, if your basement contains an unused oil tank, you stand to gain by having it removed and discarded. In response to the growing demand of Northeast homeowners, Smart Touch Energy sells heating oil online. We serve customers in Connecticut, Delaware, Maine, Massachusetts, New Hampshire, New Jersey, New York, Rhode Island and parts of Maryland and Pennsylvania. With prices as low as $0.40 under the EIA average, our customers save time and money. To learn more about our services, products and pricing, click on over to our services pages.